"Syrian refugees came ashore near the village of Skala Sikamineas on the northern tip of Lesbos, a Greek island. After reaching the island, they had to walk 34 miles to Mytilini, the capital of Lesbos. When the @magnumphotos photographer Paolo Pellegrin visited the island in early September, as many as 20,000 people were waiting for the registration papers that would allow them to continue their journey to the European mainland — a once-quick process that can now take up to two weeks. The grim situation in places like Lesbos is unlikely to improve until mid-October, when crossing the Mediterranean becomes too treacherous for all but the most determined or desperate. But experts predict even greater numbers to make the crossing next year. 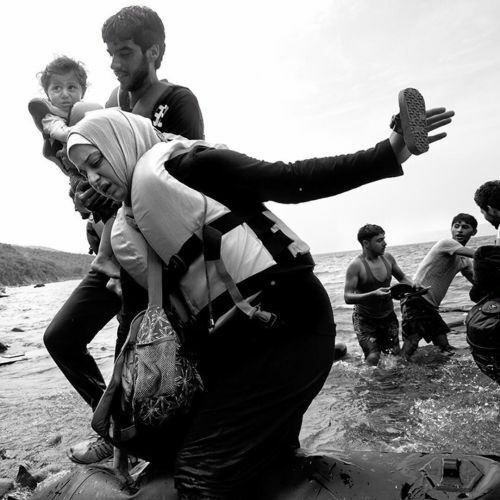 Paolo Pellegrin traveled to Lesbos on assignment for #NYTMag." By nytimes on Instagram.